I think we can all agree, 2013 has been a strong year for the stock market thus far. In the first 5 months, the S&P 500 index had shot up 14% until taking a small dip in late May. And this has been the longest rally since the financial crisis in 2008/09. So what do we have to thank for this stock market boom? Or is it who? ALSO READ: Congratulations May Winners! The Presidential Election Cycle Theory says that the performance of the stock market follows a similar pattern based on the four-year election cycle. Meaning that, on average, the stock market performs the same way in each of the four years that a president is in office. Year 1: Right after election. The first year tends to be the weakest of all four. Year 2: Midterm election. The second year usually does a bit better than the first, yet still provides sub-par returns. Year 3: Pre-presidential election. The third year tends to be the strongest of the entire 4-year term. Year 4: Election year. 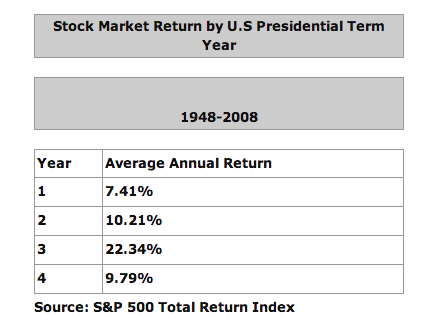 Not as good as the third, but the fourth and final year of the presidential term still brings with it a strong stock market performance on average. How do we explain this constant similar pattern? Well, one explanation is that, after the President is elected and exits campaign mode, he works hard to fulfill his campaign promises. The platforms presidents run on are not typically aimed at strengthening the economy but instead at political issues such as tax laws. This explains the relative weakness in the first two terms. Of course, Obama has not had that “luxury”. Coming into office at the brink of a financial crisis forced the President to make the economy his primary focus on day #1 of his new job. And it showed. During Obama’s first term, stocks soared 85% based on the S&P 500! Now, in year 1 of his second term, that number continues to grow. If this year is meant to be the weakest of the Presidential Election Cycle, then all I can say is bring on the next 3 years!